Have you ever had a memory instantiation problem that was impossible to track down? Here is a post that might help you with that kind of thing! After finding what it was, we can conclude that this is not a real leak but a irritating behaviour of the Flash VM. Still, you should all be aware of it! If you use Starling, I suggest you build from sources as these instantiation are gone now. There are a couple left but no big deal. We also saw that Nape was using a LOT of anonymous function call and some try catch. This create what’s called activation-object. And there was a lot of these. So by removing anon-calls and try catch we were able to remove a lot of instanciation. And After removing the debugging tools, It was clear it was coming from haXe or Nape. Then I wrote a Scala script to try to identify samples that could have been missed, but that didn’t help me much since that was only an override of constructor and constructorProp avm opcodes. So I decided to look a bit further into the bytecode and found something very interesting. After simplifying the problem multiple time, I got this very simple code to demonstrate the bug. Because Nape has that very nice abstraction layer, it can support both standard DisplayObject as well as Starling 3D DisplayObject. The leak happens when Nape try to set the DisplayObject properties like .x, .y, .rotation, etc. And now, a simple loop that set .x and .y values on that DisplayObject, and on a UnTyped object representing the abstraction layer. So basicly we have the same DO Object in memory, and we access it via a Typed or an UnTyped variable. When accessing it with the Typed on, nothing happens, The memory is not impacted at all. But when accessing through the Anonymous Object, BAM, 1 Mo/sec. wtf? I don’t know if you see any difference between the Anonymous function and the strickly typed one, but for me they look pretty much the same! getlocal0, getProp, getlocal2, setProp. Again, when we comment out “this.mDO.x = number1;“, there is a lot of memory allocation, and when we comment out the other one “this.mAnonDO.y = number1;” there is zero allocation. So if it’s not in the opcodes… it’s deeper! 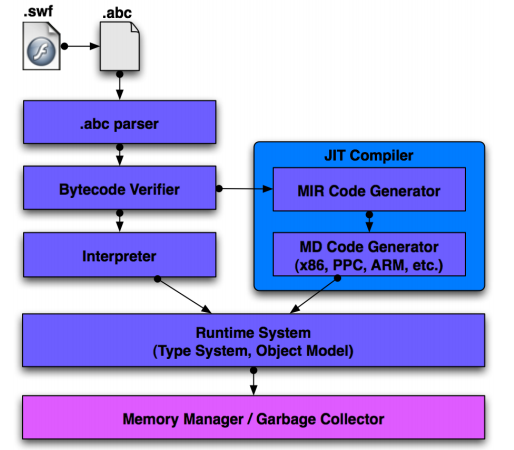 For those who have read the AVM2 Architecture documentation, you might remember that after the opcodes there are still a big phase to go through: The JIT, including Intermediate representation, and Machine Code Assembly. As demonstrated in the graph, the intermediate representation is part of the JIT. When the abc is ready to be processed, the JIT compiles it in the MIR, and then the result is process for your specific machine (Win32, MAX, Linux, etc.) in a Machine Dependant Code. To find that damn memory leak, I had to output that MIR code. But it is possible to output it in old version of the player! What the hell is that! The difference is really that one variable is strictly typed, and the other not. No need to say that just by looking at the number of instructions, you KNOW it will be a lot slower. So I though *bingo*, there is our allocation! *sight*… It’s not over yet! 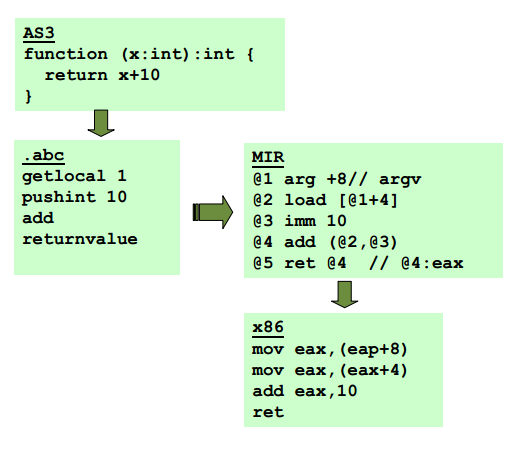 I knew that the memory growing was not a problem when using Int instead of Number. ..So it’s not the Alloc from the MIR code that create the memory. Could it be directly from Tamarin? Let’s open some code! Digging even Deeper (Tamarin Core)! Interesting… I always like the feeling of viewing Alloc in a line of code. Ok so I guess we are getting a lot closer to the source now. Again, you can see the allocDouble in there. But you can also see the return integer Atom part! Again I forgot about that! dynamic type switching from int to number.. but also from number to int! And… here we go again… zero instantiation! I guess the only thing left to look at is the allocDouble() function right? Oh my! look at that! A call to allocate the memory for a double! At runtime, when you use anonymous object, the JIT have no idea of what type it is, and when you need to set the property on one of these object, it need to validate the objects, and instantiate a new Atom to copy the values. It’s not the case when you use strictly typed object because when it’s ready to set the value, it just does! I didn’t find any great way to solve this problem except from using strictly typed object. Going back to Nape, it means that it cannot use the abstraction layer like it was designed. The only way is to expose a generic management for classic displayobject, and overridable functions to give the possibility to an external framework (like Starling) to do updates of properties in a strictly typed way. Awesome post! I’m very glad my work on one of my projects led to finding this bug out! Thank you for helping us with hunting it, I think we wouldn’t not track it so deep without your help. Oh focus I forgot to include your name in there. And I also forgot your early test on Starling with Nape!! Haha, it’s OK, thank you! It’s more important you found a source of this bug and it is now in Adobe bugbase, thanks to you and Luca! Good catch ! Well done. I guess this means all those tween engines, dynamically tweening properties, suffer from this problem too. For Nape could we imagine to provide an “update” function which would then explicitly update DisplayObjects or Starling DisplayObjects? Hey, Philippe! Nape already has updateGraphic callback – we discussed that with Luca tomorrow – there is one path to avoid this bug and keep Nape compatible with both native and Starling DL – kust to cast internally Body.graphic to the native Flash DisplayObject and move\rotate it, and don’t cast\move\rotate it if updateGraphic is set, assuming user will cast it to needed type and move\rotate it himself right inside the updateGraphic callback function. Maybe BetweenAS3 does that, which would explain why it has such a good memory management but a large number of classes. This is what you call “boxing” in VM design : because it’s not strictly typed, you need to know from its sole memory address/content what is the actual type. So you need to allocate a “memory box” (hence boxing) that will both store the value and help you know its actual type. Most of the dynamic VMs perform boxing for most of the types. For instance the NekoVM uses 31-bits unboxed integers (last bit always 1 to differentiate between actual pointers and int values), and all floats are boxed using 4 bytes of header (store the type) + 8 bytes of data (the actual double). I know. But to be very honest, “Leak” drive a lot more ppl to read the post. I corrected the statement in the introduction. You are right that I should not mislead ppl on what it is in reality. Wow, great post! This should serve as yet-another reason to use strictly-typed variables! Hey ,Awesome Post , i was wondering which flash player version you used . I tried to reproduce the leak but couldn’t . Hm … unfortunately I can’t think on anything on the Starling side that would allow us to circumvent this. We’d need some kind of interface that is available to both libraries, and I don’t think there is something like that. you could create a specialized adapter for each class that would hold an instance of it and forward changes on x/y properties. Luca already solved it internally in Nape, if you’ll set the Body.graphic and Body.graphicUpdate will be null, Nape will cast Body.graphic to the native DisplayObject and move\rotate it, but if graphicUpdate will be not null, Nape will not do with Body.graphic anything giving a dev to make it himself in the graphicUpdate callback. I think it’s pretty easy to use it now with Starling – almost as before, only thing you should consider now – is to cast Body.graphic to the Starling DisplayObject before moving\rotating it to avoid this memory exploding. Aha, that sounds just perfect! You’re right, that’s a great solution — thanks, Luca! Very interesting read. You might want to talk to tamarin’s devs about this, they have an irc channel (irc://irc.mozilla.org/tamarin) and a mailing list. It’s usually more productive than going through adobe’s bugbase. This article is really amazing!!! i have been an as3er for more than 2 years and i always know that it’s not good to use non-strictly typed object, but i am never aware of the consequence. I am working on the memory leak problem of our project and i do think this post will help a lot. This is a massive problem for me, since I developed an observer/inspector-based interface framework and use lots of dynamic property accesses to read from observed objects and write into UI components. Damn! I’m going to search all “:*” in my project. « fastSort, faster is better!